From Venezuelan chef Carlos Garcia—whose flagship eatery in Caracas, Altos, was ranked among the best in Venezuela and Latin America—comes this highly anticipated Latin American restaurant in Brickell. Obra, Garcia’s first project stateside, opened in spring to much acclaim. And do believe the hype. Cooking doubles as performance art thanks to a fully open kitchen (complete with a Josper oven) where skilled chefs sear, sauté and grill in harmony. 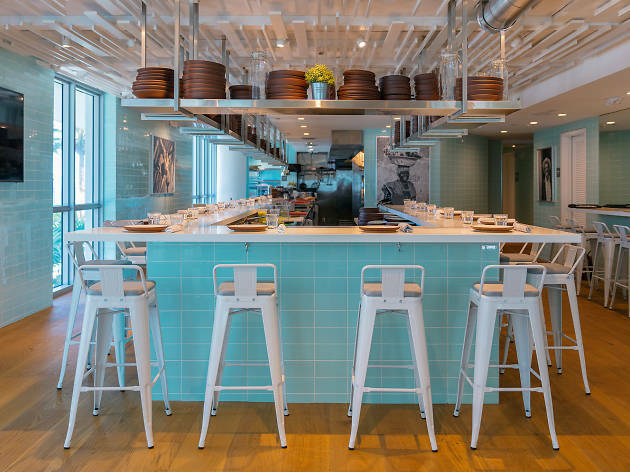 Take a seat at the expansive counter for the best view of Obra’s singular culinary show. Dishes are casual Venezuelan with an upscale, global spin, featuring ingredients such as uni and octopus in place of traditional proteins. The fried snapper with trifongo (mofongo mash made with two types of plantains and yuca) is not to be missed.